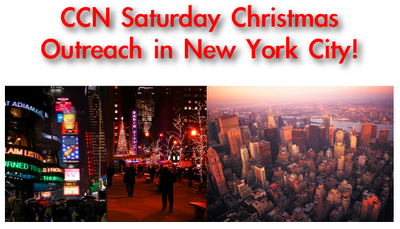 Come to our next CCN Saturday! Come and enjoy the wonderful, colorful sights of New York City around Christmas time and share with New Yorkers what the real meaning of Christmas is. We will be doing one-to-one witnessing, Christmas caroling, and open-air preaching after a time of group worship, prayer, and the Word of God! Then, join us at Dallas BBQ's in Times Square for dinner and godly fellowship!